With the UK in the midst of what can only be described as a tropical heatwave, we’ve found our minds wandering somewhat away from the snow-covered mountains of the southern hemisphere to what’s going on on the sun-drenched slopes of our favourite European mountain resorts. Nestled at the foot of the Vanoise National Park, Brides-les-Bains provides a gateway to some of the most spectacular natural scenery and active challenges in the Alps. While we all know that the 3 Vallées area has a huge amount to offer in winter, it’s also a fantastic summer base for a huge range of mountain activities. Set down in the valley surrounded by towering mountains, Brides-les-Bains has the ideal location for those wanting to enjoy all that this area has to offer. 39 hikes begin in the town, with 17 that can be done in under 3 hours in case you want to fit more than one in. You can get your adrenaline pumping with hiking, cycling, mountain biking, climbing, kayaking and rafting opportunities. Or if you like your summer holidays to be a bit more relaxing, take to one of the area’s two golf courses. Located less than 20km away from Brides-les-Bains in the nearby resorts of Meribel (18 holes) and Courchevel (9 holes), and are undeniably two of the most beautiful golf courses we’ve ever seen with spectacular views over the mountains. However, what really sets Brides-les-Bains apart from other mountain resorts for us is its focus on wellness and health. With so much activity on offer that is sure to attract holidaymakers who like to move their bodies, this wellness focus really rounds Brides-les-Bains off as a seriously enjoyable summer destination. Like many keen skiers, many of the team here at InTheSnow love being out the great outdoors all year round and often this means swapping two skis for two wheels and taking to the hills. From enduro mountain biking to serious road cycling, the mountains have a whole lot to offer for bike fans and Brides-les-Bains certainly does not disappoint. In terms of road cycling, there’s a huge amount of choice and variety in both the direct surrounding area of Brides-les-Bains and further afield, ranging from legendary itineraries to routes more off the beaten track. Tried and tested favourites include the Cormet des Roselend – “The Great Alp Route”. Culminating at 1968 metres, this historic route offers stunning views of the mountains and the Roselend lake. The Col de Iseran is another firm favourite of the area and has hosted the famous wheels of the Tour de France not once, not twice, but five times. The highest road pass in the French Alps, this route takes you up to 2770 metres. However, if you think hosting the Tour de France five times is a lot, the similarly legendary Col de la Madeleine has been climbed a whopping 25 times by the Tour. A 24.5km ascent, passing through some of the most beautiful scenery of the Savoie region, this is a challenge many cyclists dream of taking on. In a few days La Madeleine will see the Tour take on its famous climb for a 26th time as part of Stage 12 on July 19th. If you’re someone that enjoys a hill climb or two, Brides-les-Bains is your perfect destination. The area has several ski resorts that boast enjoyable (depending on your definition of the term) hill climbs.These resorts are well connected with many restaurants and bars that provide a very welcome rest stop after a morning’s hard work! The climb to Courchevel for example, clocks in at just over 20km and takes you through some beautiful pine forests, leaving you in one of the Alps’ most famous resorts with a spectacular view of Mont Blanc. For those that may not be so keen on the uphill side of things, you can choose to stay further up the valley to benefit from the area’s cycling routes without the need for many climbs. Or, for the ultimate ease when heading uphill (and perfect for anyone that may be travelling with younger or older guests) e-Biking is also available. Increasingly popular in mountain resorts recently, e-Biking allows you all the entertainment of traditional mountain biking, but without the tough uphill climbs. You can rent e-bikes for the day and explore yourself, or hire a guide to show you the best spots to make the most of your new electrical steed! With the area keen to encourage people to give e-biking a go, there are some good offers around for e-bike hire. For those that prefer the adrenaline of mountain biking, the vast area of the 3 Vallées allows access to a huge MTB playground. Whether you’re into enduro, downhill, freeride or simply enjoy cruising through the wonderful alpine scenery there’s something for all. Site of numerous French and World Championships, the Méribel Bike Park offers a range of trails to suit all abilities and allows access to a descent all the way down to Brides-les-Bains. With 10 Downhill tracks, 10 Enduro itineraries (34km in total), 4 cross-country trails and 3 dedicated E-MTB routes, all serviced by two ski lifts. With easy green and blue routes offering stunning views over Mont Blanc, to more challenging forest routes with jumps ideal for competition training, there’s something for everyone to enjoy here. 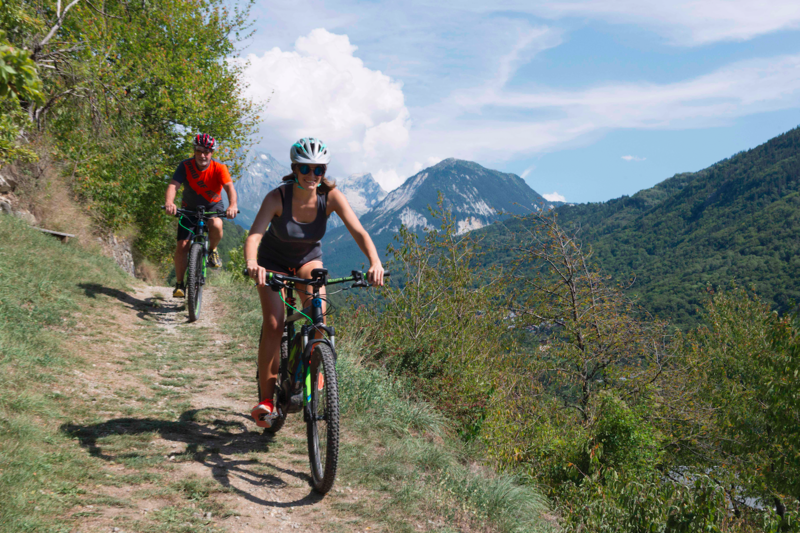 A daily bus service from Brides-les-Bains allows you easy access up to the Bike Park, meaning you can stay further down in the beautiful valley whilst still enjoying all that the mountains have to offer! Specialised companies such as Espace VTT offer expert courses in all these disciplines as well as tailored coaching, tours, bike rental and repairs. After all this activity, you can bet your muscles are going to be tired and this is when Brides-les-Bains really comes into its own as an active summer destination, with a focus on wellness and recovery – making the most of the mountains in every possible way and combining the benefits of a fulfilling activity holiday with a relaxing spa getaway. 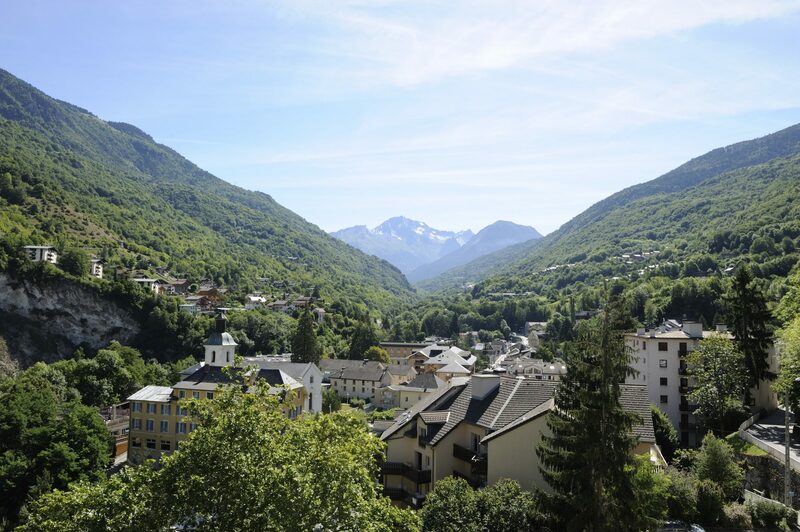 Known as ’the peak of health at the foot of the 3 Vallees”, Brides-les-Bains is a mountain destination where your mental health will get as much of a boost as your physical health. Brides-les-Bains is France’s leading thermal spa resort, with 2018 seeing the opening of the all new Thermal Baths and Grand Spa Thermal. Over the last two years, this spa has undergone a complete overhaul, with €15 Million invested in all new features, designs and treatments. It was officially reopened in March of this year, so visitors this summer will be some of the first to experience it for themselves. The main 600m² pool area offers a swimming lane, an aqua fitness area and a ‘fun’ pool (complete with 2 jacuzzis, 2 bubble beds, underwater jets, and an underwater circuit). New nutrition and fitness areas complete the renovations. The entire spa boasts a sleek, sophisticated design, it’s easy to see why visitors are loving the new renovations already. Interestingly, this spa specialises in slimming treatments and courses and comes highly recommended for this. The spa’s three slimming treatments and two wellness treatments all use water from the Brides thermal spring, which has diuretic properties and is thought to improve circulation. You can choose from individual treatments or programmes of treatments that include spa treatments, massage, relaxation, physical activities and even nutrition demonstrations and dietary consultations. Events throughout the season include free conferences with experts from the spa, covering topics from feeding your brain, to weight, nutrition and arthritis. It’s ideal for those who feel their lifestyle needs steering in a more healthy direction or want to learn how to make positive changes. 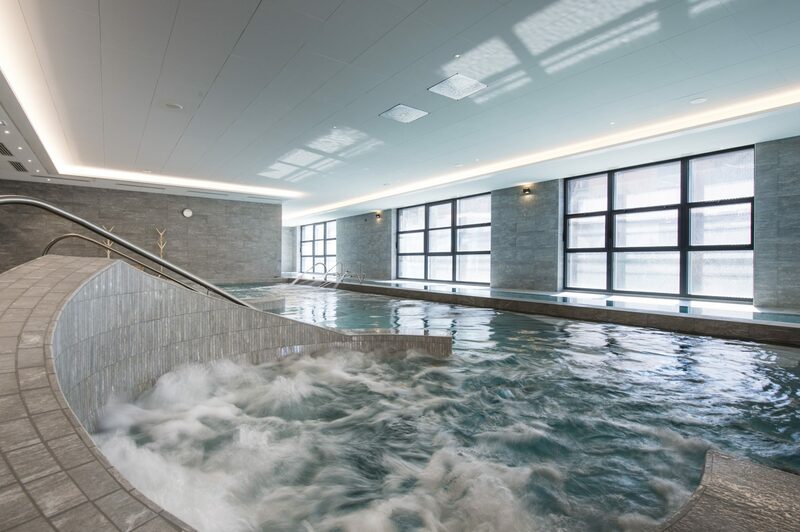 Modern, spacious and zen, the Grand Spa Thermal is the perfect place to relax and regenerate before heading back to the hectic nature of everyday life! Brides-les-Bains is also the only thermal spa resort with a nutritional label, thanks to fourteen chefs trained in nutrition operating in the resorts’ hotel-restaurants. Complete dietary control is available throughout the resort and is practiced from caterers to esteemed hotel chefs, to enhance the resort’s ‘weight loss’ promise. Each week, the tourist office arranges 22 ‘health’ activities – all outdoors and free of charge, including 6 different gym classes, 12 themed walks, 2 stretching classes and 2 dances! . They also arrange two guided hikes a day, led by professional experts in the area and divided into ‘shaded’ and ‘sunny’ routes – an extra choice that is much appreciated! Throughout the summer season that’s a staggering 372 walks! As if this wasn’t enough, other workshops you can take part in include, mandala, beauty, yoga, line dance, reflexology, Nordic walking, photography, cooking classes, dance classes, meditation and even wood carving from just €2-15 per workshop. So as the heatwave kicks in, head somewhere that will nourish both your body and your mind with epic outdoor activities and exceptional wellness facilities in Brides-les-Bains. A Snow Sports Fan Experiences Summer in Les Gets – And Loves It!